After Tony Trimingham’s son, Damien, died of an accidental overdose he decided to make something positive from his tragic loss. 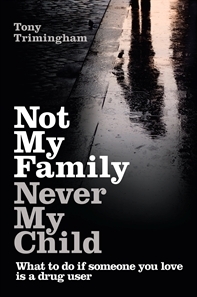 His book Not My Family Never My Child is an invaluable resource for those families doing it tough. With compassion, acceptance and understanding borne of experience, Tony leads the reader through steps to recovery illustrating milestones and hurdles in the path with real life testimonials. If you, or someone you love, is suffering with addiction, there is somewhere to turn to for help. Family Drug Support (1300 368 186) offers support, advice and companionship without a religious focus. Meetings are held regularly in NSW, ACT, SA, VIC and WA. Still not in NT or QLD, but I’m sure Tony would be happy to help you organise one if you’re interested. Through Damien’s death, many other lives have been saved. I hope that Thrill Seekers and the lesson’s of my brother Matty’s death will also help those who are heading down the same path. Prohibition is not the answer. Education, compassion and awareness is.